Store Hours: Mon. - Fri. 8:30a.m. - 6:00p.m. Furniture from Start to Finish! 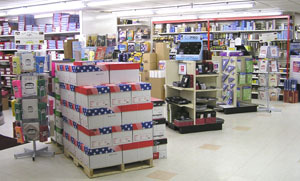 Way Office Plus is proud to offer a full line of office supplies and services. From paper clips and copy paper, to ink jet cartridges and back up tapes; from custom rubber stamps to imprinted business forms we've got it all! We have over 22,000 items available for next day delivery, including an extensive selection of computer, printer, copier and fax supplies. With Value Plus pricing on thousands of the most popular items, with a trained professional staff standing by, with no hassle returns - no wonder we're your best value, everyday! Call us so we can send you a catalog and create your log-in and password for our Internet Order System. © Copyright 2004 Way Office Plus. All Rights Reserved.